Surfers love the ocean. It’s our playground and our respite. When we’re surfing, we are immersed in nature and feel connected to the sea, the wind and the tides that influence the waves we ride. While surfers are keenly attuned to the coastal environment, surfing typically involves products that are not environmentally friendly. Let’s talk about your surfboard. If it’s fibreglass laminated with polyester resin over polyurethane foam, it’s chock full of hazardous chemicals like styrene, VOCs (volatile organic compounds), and isocyanates, which can be harmful to shapers and glassers. At the end of its life, it can’t be recycled. Your shred stick will end up in a landfill, decomposing very slowly – and because a typical surfboard is made using petroleum products, it leaves a carbon footprint. Rising carbon dioxide levels caused by human activities, primarily the combustion of fossil fuels, impact the surf in two ways. Sea levels are increasing as ice caps slowly melt due to the warming effects of added CO2 and other heat-trapping gases in the atmosphere. Scientists have predicted that iconic breaks like Trestles in California will see wave quality decreasing as the sea level rises and the breaks spend more time swamped with higher tides.. But the excess CO2 is doing more than heating the planet. It’s also changing the chemistry of the ocean. The sea absorbs our excess CO2 and in the process becomes more acidic. This has serious consequences for marine life including corals, which find it difficult to maintain or build their structures in seawater with a lower pH level. Jyotika Vimani, the director of technical operations for the Wendy Schmidt Ocean Health XPRIZE, says coral reefs are suffering from “osteoporosis of the ocean,” also known as bleaching. In the future, waves that rely on coral reefs to form may no longer break as well or at all, as the corals dissolve due to increased seawater acidity. What can you do to be a more environmentally conscious surfer? 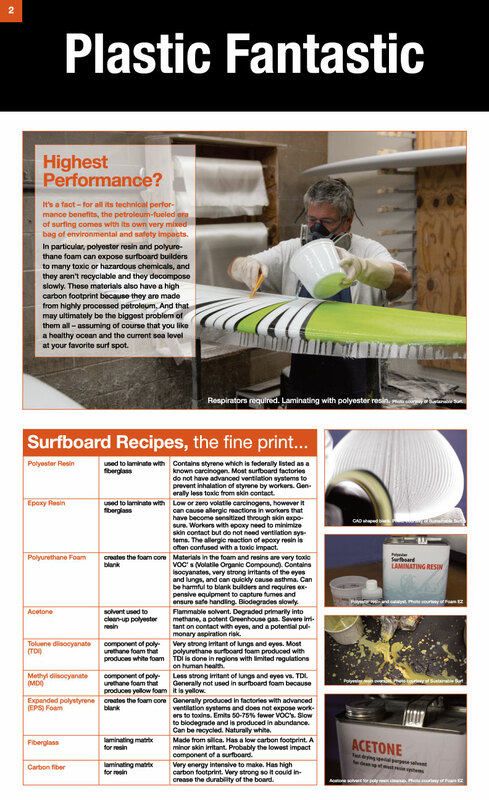 Choosing a board made with EPS (expanded polystyrene) foam glassed with standard epoxy resin is a less-toxic step in the right direction, but you can go farther when you buy your next surfboard. If you choose one certified by Sustainable Surf’s ECOBOARD Project, you’ll know that it’s been made with the environment in mind and has substantially lower carbon life cycle emissions. ECOBOARDS include one or more of these features: a primarily sustainable/renewable structure, such as wood; a blank made of at least 40 per cent recycled or biological materials; and epoxy resin with at least 15% biological, low VOC content. Each board that meets these standards is labeled to indicate that it has a “significant and meaningful reduction in environmental impact” according to Sustainable Surf. You can ask your shaper to follow the ECOBOARD standards, or buy a certified board from brands such as Firewire (worldwide), SUPERbrand (U.S.), Joel Customs and Cork Surfboards (U.K), Harmony Surfboard (Spain), and Andy Haitz Custom Boards (Switzerland). These companies and others on the growing list of ECOBOARD shapers worldwide have an increasing variety of earth-friendly materials to choose from in crafting a greener surfboard. One of the epoxy bioresins many use is Super Sap, made by Entropy Resins. Life-cycle analysis shows a 50% reduction in CO2 emissions from this plant-derived white resin over traditional petroleum-based products. Also unlike conventional resins, it can be applied without using protective respiratory gear. Jason Koons of SUPERbrand says it “kind of smells like Thai food,” and he believes that it’s as good as any resin on the market. Now Entropy is working on the next leap forward, designing a bioresin that can be dissolved by hot vinegar, which would allow surfboard decks and other composites to be recycled. There are also better choices for blanks than traditional materials. Polyurethane is bad for the planet, EPS foam is better, and recycled EPS foam is better still. Marko Foam takes waste EPS packing material – the kind used to protect products like TVs during shipment – and incorporates it into new surfboard blanks that have 25% recycled content. Bio-based blanks are next on the horizon. BIÓM blanks will be available soon, and they’re made from 99% polymerised sugarcane biomass expanded with CO2 “borrowed” from the air. These waterproof blanks are biodegradable and industrially compostable. Down the road, it may be possible to grow mushroom foam into a surfboard blank; it’s already in use as fins and as protection for ocean buoys. One of the ECOBOARD principles is that a verified board will be as good as or better than a conventional one, and shapers like Koons are committed to this idea. For an example of a leading-edge certified ECOBOARD, take a look at one in Firewire’s Timbertek line, which the company says are the least toxic and have the smallest carbon footprint of any commercially-available surfboards. Firewire has made three boards in its regular product line available in Timbertek, with more to come. These surfboards have a lightweight EPS core covered with sustainably-grown Paulownia wood, and are hotcoated with Entropy bioresin. They are not only lovely to look at; they also perform like Firewire’s standard-material surfboards. Firewire plans to transition soon to using bioresin in all of its boards, and already ships its products using recycled and reusable Bast packing materials instead of throw-away bubble wraps. What else can you do to be a green surfer? So you’ve bought an eco-surfboard. What next? First, trick out that new board with earth-friendly accessories, like a deck pad made of cork harvested by peeling bark from living cork oak trees. Add a recycled leash. Top it off with an eco-wax comprised of farm-grown ingredients instead of petrochemicals, roughed up with a bamboo wax comb. Slide your stick into a day bag made of hemp or upcycled billboards, and pull on a limestone wetsuit (available soon in the UK) instead of one made from petroleum-based neoprene. Then tuck your board into a rack on the side of your bicycle and pedal to the coast instead of driving, or if you must drive or fly, buy carbon offsets. After you surf, spend two minutes cleaning up the beach. And get involved with groups like Surfers Against Sewage and Surfrider that are working to protect our oceans, waves and beaches. The earth will thank you for it, and maybe your favourite surf breaks will be around a while longer because of you.